You think this is creepy? Just wait. I’d like to know more about how movies actually get made, from green-lit script to the premiere, because I want to know how and why Splice changed from the movie I think it was meant to be to the movie it ended up being. Splice tells the story of Clive and Elsa, two biochemists who combine genes from different organisms to make chimeric creatures that produce potentially beneficial chemicals, proteins, extracts, etc. Following the scientific and soon-to-be commercial success of their most recent deoxyribonucleic casserole, resulting in two blobs named Fred and Ginger whose genome could lead to potent livestock medications, Clive and Elsa try something more technically and morally challenging: inserting a mélange of non-human DNA into a human ovum. The resulting embryo is viable, grows really quickly, and allows the plot to progress. The movie at this point seems like it’s ready to deal with some issues that were probably front-and-center in the original script. Is it morally acceptable to play around with the human genome? If so, how much should we monkey with it, and should we ever introduce other species’ DNA into our genetic code? If so, how “human” must something be before it should be treated as such? Instead, we get a couple-minute long, half-hearted discussion of the ethics of such an experiment, ending in an actual countdown-to-zero scene where a last-second decision is made. Rather than defuse a bomb, this fateful micropipette fertilization creates two of them: human-something hybrid Dren, and the movie itself. From that moment forward, Splice toes the sci-fi horror-drama line pretty faithfully, failing to bring any new ideas to the table. Almost everything about the movie is predictable. The heady feeling of success from their recent project and their intellectual arrogance cause Clive and Elsa’s scientific overreach. They clash with the profit-driven bean-counters at their lab. The result of their new experiment ends up being nearly impossible to control, and becomes something they couldn’t possibly have anticipated. People and animals die as a result. There are really only two unpredictable scenes in the whole film, and believe me—you’ll know them when you see them. In fact, the question that Clive and Elsa implicitly ask themselves is the same one the viewer asks of director Vincenzo Natali: did he really go there? Yes, he did, and those scenes are the only reason this movie will be remembered in a couple years. The acting isn’t bad per se, because there’s not much acting to do. The movie is driven nearly entirely by plot, with very little character development. This is almost criminal, since the main characters are played by Adrien Brody and Sarah Polley, both great actors. Any hints of interesting past events, mainly Elsa’s family history and her motivations for championing the human-other experiment, are just little crumbs dropped and then largely forgotten. Her increasingly tense relationship with Dren gets surface treatment for a couple minutes but is essentially glossed over. If that’s disappointing—and it is—we find out next to nothing about Clive. Splice isn’t a complete loss, though. 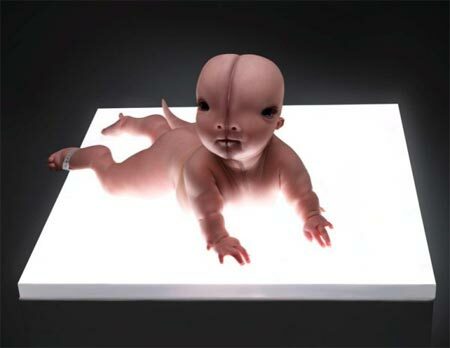 It has an odd sort of (bilateral) symmetry which is illustrated quite literally in the maturation of Dren, who early in her development still has the hemispheric differentiating line down its/her face. Early lab scenes are framed symmetrically and include props with this property, with the lighting stark and cold and colors mostly blues and whites. Even the plot is mirror-image: bring a new life form to term to see what happens, things go wrong. Then things go really wrong, and someone decides to bring a new life form to term to see what happens. Also, the decision to make Dren look human enough to be a sympathetic character, but also alien enough to be mysterious and at times grotesque, adds a proper creepiness to some of the events that unfold. All in all, Splice ends up a pretty typical, and unfortunately forgettable, sci-fi flick, when it could have been a thought-provoking exploration of the nature of humanness. Its message is the same one I would give to the folks who meddled in the making of the movie: when you mess with the original recipe, don’t be surprised if you’re not pleased with the results.